The wind is howling outside (“la bise noire”, it is called, which sounds rather like a rather dark and dangerous kiss…). The radiators are full on. Switzerland is slowly turning into a cold, dark place. 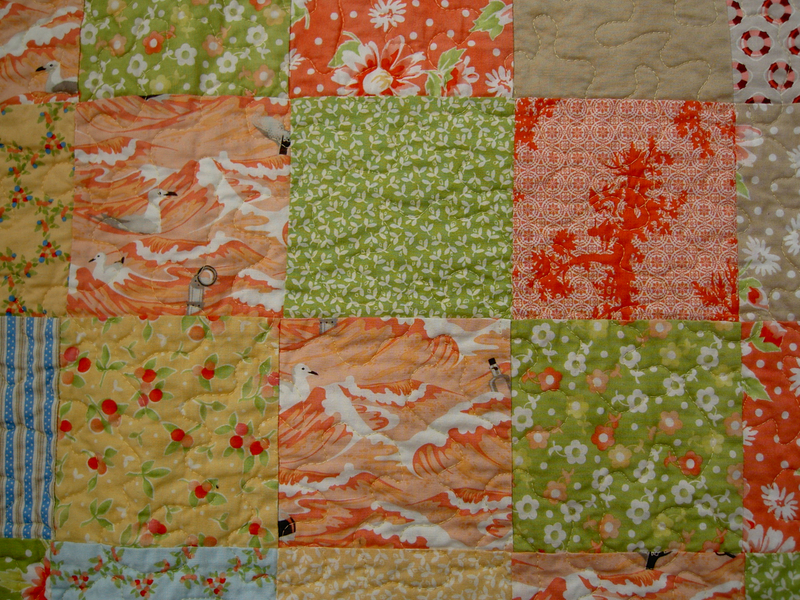 Time for quilts! I finished this little baby square one a few evenings ago, and haven’t quite got round to gifting it to my friend. The idea of getting on a bike in this freezing weather to cycle across town isn’t the most appealing at the moment. It is for a little tiny Miss E, my friend Ms J’s fourth baby, including one little angel. Hopefully this will help the littlest one feel a bit special. 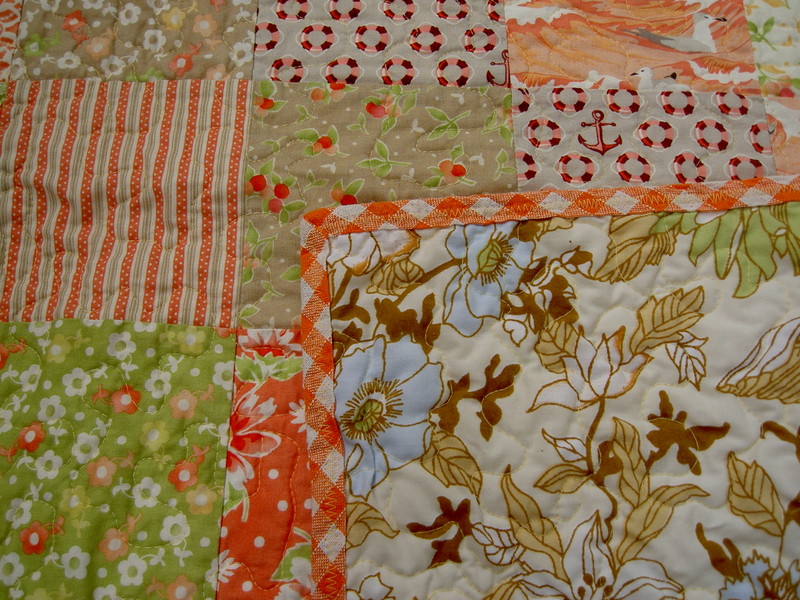 I just posted up lots of my quilts in a special page on this blog. I realise how many square quilts I have made. Hmmm…. Time to break out? 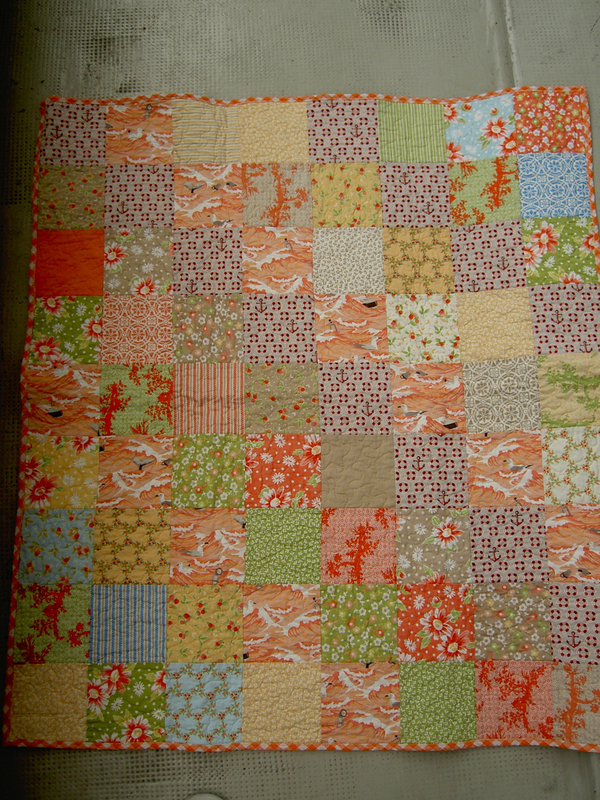 Well, the latest two that are not yet quilted are certainly not squares, so there is hope for me yet! A mix of new fabrics, and a ‘vintage’ (read: second-hand) sheet on the back. I picked up the binding in Italy, but it seems to wash rather scrappily. I should have made it myself, although I love the orange gingham. I will link this up to Finish-it-up-Friday when America wakes up. It’s always fun to see what other people get up to. I like the gingham too. I did a quilt top recently with this pattern going on and I really like yours!